The Improving Patient Experience Award underlines our commitment to providing you with the best possible care. Each year, we ask the people that we care for to let us know when a member of our staff or a team has made a real difference to you. This award gives the public the opportunity to recognise the outstanding care and support given to them by a member of staff or a team. Feel that one of our staff has made a real difference to you? Did they go the extra mile? Let us know! Nominations close 5 pm 28 September 2018 for this year’s award.You can also email us to get a hard copy of the nominations form if you prefer. 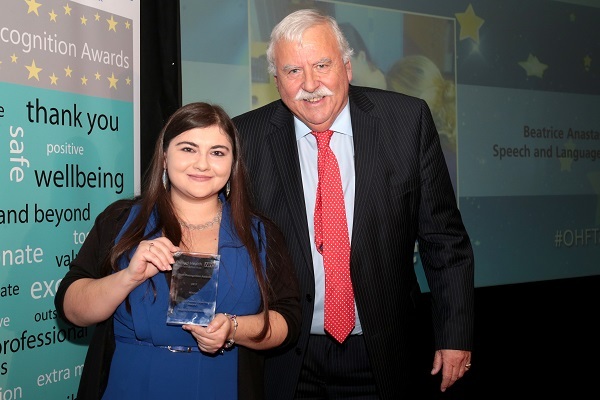 In 2017, the Improving Patient Experience Award was won by Beatrice Anastasiou, a speech and language therapist with our Learning Disability team. The family who nominated her said: “She has opened up many new opportunities we would never have imagined possible for our daughter. Find out more about the 2017 staff awards.